Show your holiday lighting spirit with a professional Christmas Light Installation from D-Tek Christmas Creations Christmas Light Installers. We design and install beautiful Christmas light displays that will light up your holiday season. Our Christmas Light Installers will help to carry out your lighting installation vision. From simple elegance of installing Christmas lights on eaves, wrapping trees, walkway lighting, garlands and wreaths, we will make your home or business stand out above all the rest this Holiday season. If you want to win a Christmas light decorating contest or just don’t want to hassle with hanging Christmas lights yourself our professional Christmas Light Hangers are here to help, give us a call today to set up a free estimate and inspection. D-Tek Christmas Creations has a large selection of in stock Christmas Lights and Christmas accessories for your holiday light installation. We do stock incandescent light sets however we strongly recommend LED lighting. It not only saves electricity over the long haul but also cuts down on the amount of extension cords needed for your Christmas light installation. This helps to cut down on install time saving you even more money. Our Christmas Light Hangers can decorate the outside of your house with Christmas lights and the inside as well! Holiday season can be very busy and sometimes the last thing people have time for is decorating for Christmas season. 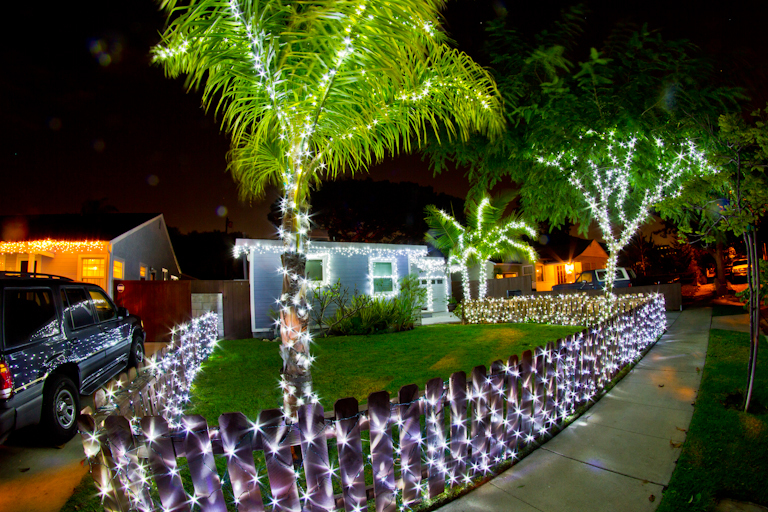 Do you want a true professional Christmas light installation at your home in San Diego County? Look no further than D-Tek Christmas Creations. Call today to set up a free no obligation meeting with one of our Christmas light install pros. Our direct line is 760-509-6368. Don’t feel like calling? Simply click the request a quote link at the top of the page, fill out the form, and one of our Christmas light installers will be in contact with you shortly. Visit our San Diego Christmas Lights Gallery to see samples of what our Professional Christmas Light Hangers can do for you. Curious about the services we offer? Visit our Services page for a list of professional Christmas Light Installer services we offer. Visit our Christmas Light Installation FAQs for answers.